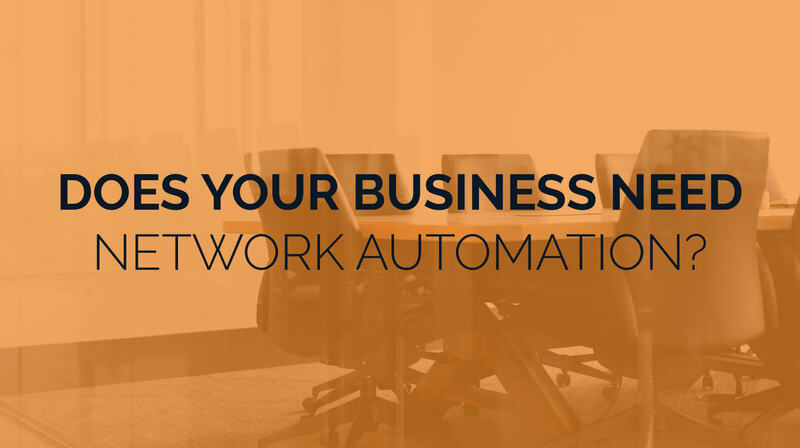 Does Your Business Need Network Automation? Network automation can improve the efficiency of your organization, but is it worth the investment? As businesses expand and their internal networks become more complex, sustaining manual network optimizations becomes less and less feasible. To cope with the rising workload, many organizations have turned to network automation, which offers the benefits of improved efficiency and reduced human error. Businesses use network automation to configure, provision, manage, and test devices and systems, so that they operate more effectively, reduce redundancy, and meet compliance standards. However, while these systems can aid businesses, they also come with some expenses and risks. Making the best decision for your organization will depend on your situation. If you’re considering a new IT network automation strategy, here are a few points to consider. How does network automation fit in with your business goals? As a growing business, you probably have several competing priorities where your IT department is concerned. Many of these, such as growing your infrastructure, upgrading your hardware, bolstering security, or cloud integration may take precedent over network automation. Your first task, therefore, must be assessing the costs and benefits of network automation relative to these other business goals, and assigning it a priority level. That said, part of your assessment should take into account ways in which network automation can help achieve these other goals. For instance, if your goal is to achieve faster and more efficient networking, you may discover that a network which can automatically optimize traffic loads may be a better solution than an upgrade to your wiring. How much time does your IT department spend on automatable tasks? Another key indicator for whether network automation is right for your business is to look at possible areas where automation could save your team resources. Many IT professionals lose hours of time every week running routine tasks that could be accomplished much faster using automation. Consulting with your team to learn more about how they spend their time and what they could put their energy toward if they had more of it can give you an idea for how automation could streamline your business. Can network automation scale with your business? Network automation has become a more pressing concern due to the rapid rate of expansion in some businesses, along with the adoption of more complex systems. Given that many organizations now operate out of a core location as well as several remote locations, use mutli-cloud environments, and require robust security protocols across all these applications, the need for an automated network that can both help your business scale, and grow with it as it does is paramount. Can network automation protect against human error? The more a task calls for repetitive processes, the more likely it is to lead to human error. It’s not that people are lazy or inept, it’s that repetitive tasks are boring, and as such require higher levels of sustained concentration to retain focus. When a person’s attention inevitably lapses, the result can be loss of data, network downtime, or a security failure. However, by setting up an automated system, businesses gain the advantage of a faster process with reduced error. Meanwhile, employees are free to put their critical thinking to work solving problems that can’t be automated, most of which tend to be higher-value to businesses, and more rewarding for employees. Do you understand the risks of automating? As much as businesses stand to gain from network automation, it’s not without its risks. For one, the more complex a system, the more costly it will be to design an automated solution. Because of this, investing in an automation strategy, while likely to pay off in the long run, does require up-front costs. More importantly, however, a poorly-designed system carries the risk of propagating an error rapidly. While a person might only make a mistake once, systemic errors will repeat until they are discovered and resolved. Because of this, a network automation protocol, especially one which will affect the business significantly, should only be designed by skilled professionals who understand the consequences of a mistake. Do you have staff or trusted IT partners that can help you implement a strategy? Because of this final concern, organizations interested in adopting network automation should discuss the situation with their key IT personnel, or else with a trusted team of managed IT professionals. These individuals should be able to create a plan for your organization that identifies possible areas where automation would offer the greatest improvement, as well as a risk mitigation strategy. And, since many network automation protocols involve compliance concerns as well, the team you work with should understand how your system meets relevant compliance regulations, such as those laid out in NIST. Well-managed network automation projects can be a significant boon to many businesses. Network automation is the way of the future. In many cases, automation has been incorporated into so many applications and devices that users aren’t even aware of how much has been handled for them. And where automation isn’t already the norm, businesses are finding that moving to automation reduces the workload of their key staff, freeing resources for more important internal projects, and lowering the risk of human error. So, while network automation may not yet make your top priority, it should be on your list. By adopting a system early, you will gain a competitive advantage in the marketplace, and better prepare your organization for future expansion.